On windy or rainy days, you might stop to appreciate the comfort that your walls and roof provide. These materials might be the star players of your home or business but they only work properly when their supporting characters are working as well – this is where a Kitchener eavestrough cleaning comes in. The gutters that line the perimeters of your roof can make a huge difference to the outcome of those rainy days, so it is important to take care of them! Whether you are unable to keep them clean on your own, or you simply don’t have the time, our Gorillas can help with our Kitchener gutter cleaning. Whether you are dealing with a single-level or multi-storey building, reaching your gutters can be tough. Climbing up on a ladder to reach your drainage system can be more dangerous than you might think. One wrong step or a bit of soft ground, can tilt those ladders and lead to a tumble. In addition to your health being at risk, ladders can put pressure on the system itself. It does not matter how clean your gutters are, if they are broken off of your home. 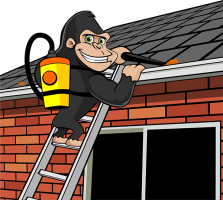 Instead of taking a risk with your drainage system, trust our Gorillas for your Kitchener eavestrough cleaning. Getting the right results for your gutter system requires the right tools and techniques. Getting up to eye level with your gutters is a task all on its own but clearing them out takes more skill than meets the eye. Cleaning gutters by hand can remove the larger pieces of debris but it leaves behind a lot more than it takes away. Small but heavy material like dirt or tree needles settle along the bottom of your system and these are extremely difficult to remove by hand. By using high-powered vacuums, our Gorillas are able to remove every last bit of debris and every clog in the system. This process enables Gorillas to get expert results for every property in our rotation.